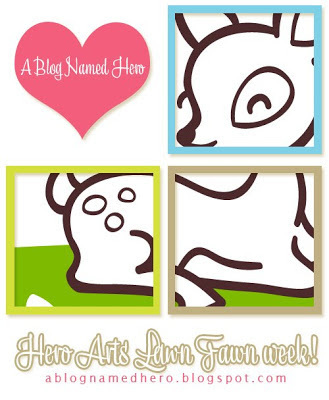 Page Master Designs Online: Hero Arts and Lawn Fawn What??? Hero Arts and Lawn Fawn What??? Hey everyone! I am so excited to share this. This week the girls over at A Blog Named Hero have teamed up with Lawn Fawn! SQUEEEE!!! We wanted to showcase how well these 2 stamp companies work together. Hero Arts is what we are all about over at A Blog Named Hero. We LOVE all that Hero has to offer from inks to rubber stamps, cling and clear stamps. We are so excited to get to play with these amazing stamps on a daily basis. For my card I went the simple route. I had a customer request a bunch of Get well Cards and I KNEW this Lawn Fawn set was the perfect choice. i just love the fun little icons. Just looking at the stamps make you smile and feel good! I stamped the Radiant Banner by Hero Arts in the Hero Arts Butter Bar midtone ink directly onto the background of my card. I then stamped the tissue box, soup bowl and spoon and the band-aid onto scrap cardstock, colored, cut out and attached to the front of the card. I added the message in the banner. It was so simple and fun. Now make sure to stop by A Blog Named Hero to see what the rest of the girls did, make sure you leave unique comments at each blog because there will be prizes! So nice to see these two great companies' stamps together! This is so pretty!! Love the adorable LF stamps, and that shade of Hero Arts ink - Butterbar I think you said - is amazing!!!! Gorgeous! Love the starburst behind all the get well cuteness! I often imagine healing light when I feel pain or sickness. This warm card is full of it!